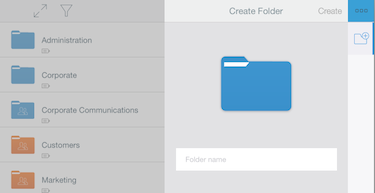 Creating of folders can be done either at the top-level or at the subfolder level. Creation can be done either through the context menu or through the top drop-down bar. For example, the screen below shows the Create Folder dialog from the top drop-down menu tap on the menu icon ( ). You can enter a name and tap on Create to create a new folder. If you create a folder from the context menu of a folder, you create a subfolder inside that folder. On the other hand, if you create from the drop-down bar, you create a folder at the same level. Folders can be deleted either from the contextual menu or from the top bar drop-down ( ). The screenshot below shows the delete icon in the contextual menu of a folder. Delete top-level folder: Deletion of a top-level folder works differently than subfolders. If you are the owner of a folder, be it private or a shared, deleting a top-level folder deletes it permanently. This is an irreversible action. You should be very careful in deleting a top-level folder. On the other hand, deleting a folder which is shared with you and you are an editor, deletes the folder locally from your account. No other users are impacted. Effectively, you are unshared from that folder. If you are a reader of the folder, you cannot delete this folder from the iPad app. Delete subfolders: Delete works differently for a subfolder than a top-level folder. For subfolders under top-level folders that you own or where you are an editor, deleting the subfolder deletes it and puts the subfolder and all its contents into deleted items. You can then restore or permanently delete this folder. For subfolders inside top-level folders where you are a reader, you cannot delete the subfolder.